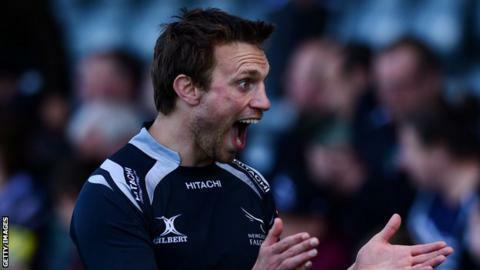 Newcastle capped off their Premiership season with a victory over Harlequins. Falcons' Richard Mayhew went over after only three minutes before both sides traded penalties and Nick Evans' try gave Quins a 16-11 lead at half-time. After the break, Scott Lawson drove over the line for Newcastle but Marland Yarde's try restored Quins lead. Captain Mike Blair ran in from 45 metres to score in his final match for Newcastle before tries from Adam Powell and Andy Saull wrapped up victory. Despite neither side having anything to play for, with their safety secured and a top-six finish ruled out, both teams put on an entertaining match in front of the 7,000 strong crowd. The hosts took an early lead after a penalty into the corner and a double line-out drive saw Mayhew go over. But it was the visitors who led at the break after Evans followed up two penalties with a converted try as he glided under the posts following a period of relentless pressure from Harlequins. Lawson's converted try gave Newcastle the lead once again 12 minutes into the second half, but Conor O'Shea's side again pushed forward and Yarde raced through to touch down and put the visitors 21-18 in front. However former Scotland captain Blair, who is set to join Glasgow Warriors in the summer, marked his final appearance for Falcons with a superb try. After the away side made a mess of a ruck in midfield, the scrum-half picked the ball and sprinted clear to cross the whitewash, before he departed to a standing ovation. Newcastle picked up the bonus point as Juan Pablo Socino's fine pass allowed Powell to weave through a number of players and score before Saull collect Ruki Tipuna's long pass and went over in the corner. Newcastle: Hammersley, Tait, Powell, Socino, Alesna Tuilagi; Catterick, Blair (capt); Fry, Lawson, Brookes, Green, MacLeod, Mayhew, Wilson, Kolo'ofai. Replacements: McGuigan, Vickers, Rogers, Witty, Saull, Tipuna, Andy Tuilagi, Kibirige. Harlequins: Lindsay-Hague, Yarde, Marchant, Sloan, Walker; Evans, Care (capt), Marfo, Ward, Shields, Merrick, Matthews, Chisholm, Clifford, Talei. Replacements: Gray, Buchanan, Adeniran-Olule, Twomey, Trayfoot, Dickson, Botica, Williams.